Last week, we posted a translation of a column from Sonic the Hedgehog series sound designer Tomoya Ohtani in which he spoke about working on some Splatoon music from Super Smash Bros. Ultimate. Sonic Team sound director Jun Senoue had his own contribution having worked on a new Mega Man 4 medley. Why did Senoue go with Mega Man for his music piece? He discussed that and more in his own column, which we now have a translation of as well. You can read it in full below. Super Smash Bros Ultimate is finally out on the Nintendo Switch. Has everyone bought it? Mario and Sonic have appeared together in the Mario & Sonic at the Olympic Games series since 2007, and then in 2008, with the launch of Smash Bros. Brawl on the Wii, they competed in battle together for the first time. Now, in this newest iteration of the series, they are once again able to enter the battle together. More than in any previous game in the series, the developers have been able to cross boundaries in order to bring players exciting stages spanning a long gaming history, and I think there have been many fans eagerly awaiting Ultimate’s release. As I’ve already mentioned, I was chosen to oversee some of the sound in the game, and was very happy to also have the chance to arrange one of the songs. In Super Smash Bros Ultimate it is not only Sonic who appears in the game but also the stage Green Hill Zone, and there has also been music added from the Sonic Forces and Sonic Mania series of games, meaning that in total there are 20 Sonic-related songs included. When I think back now, being asked to arrange Sonic the Hedgehog 3’s ‘Angel Island Zone’ track for Super Smash Bros. Brawl in 2007 was the first time I had a chance to reconfigure a historical track from the series. That track was then also used in the Sonic Generations game. And now that version is included in Ultimate too! This time around things were excitingly different. At first I thought I would be asked to pick a song to arrange from a list of related Nintendo classics, but the reality was that when I met with the team they said that as long as it was from a series appearing in the game I could choose any song to arrange I wanted. I was really surprised at such an open offer. And the origin of that idea is this. Ta-da! This is a picture of a Capcom Mega Man/Sega Sonic crossover comic book sold in America. The moment I first saw this, I immediately thought: ‘why don’t I try doing performing a Mega Man track in the style of the Sonic series?’ That’s when I started to work out how it would all go together. For the sake of a Nintendo release, a sound designer for SEGA is remixing a song from a Capcom game. When you write it down like that it does seem kind of ridiculous, but I thought this might be a really rare chance I should make the most of. From all the many songs in the Mega Man series, I decided to use music from Mega Man 4. Around the time I first played that title I was a university student still obsessed with the original Sonic the Hedgehog game, so it has a real emotional attachment for me. For this project I didn’t play around with the original melodies and tried to stay true to their roots, instead simply making the tunes more upbeat to be in line with a fighting game. Also, I thought a lot about the length of the song and the type of development process I wanted to go through, with lots of ideas floating around in my head. Eventually, with all those things in mind, I decided to pick out three songs and create a medley. First I made a demo track, and once that had ended up being approved, I brought together Takeshi Taneda on bass, ‘Act.’ on drums and myself on the guitar to record the final version as the Sonic Adventure Music Experience trio. With the help of those two, I think I was able to inject a little Sonic-like instrumental flavor into my Mega Man medley song. 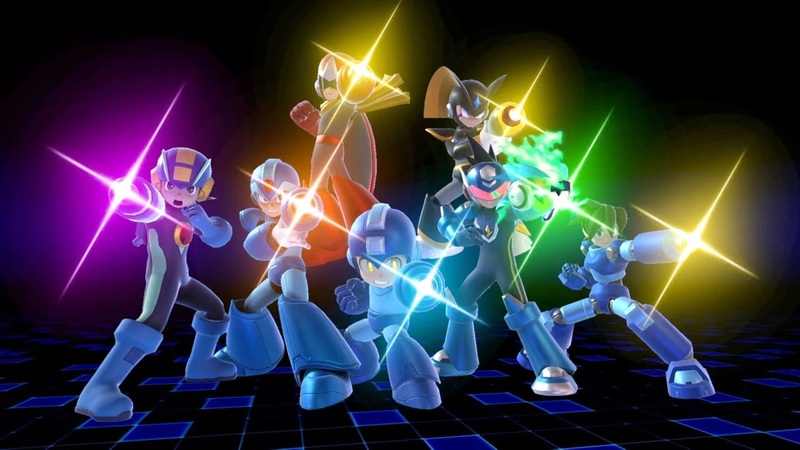 In July music samples from the stages of Mega Man’s Dive Man all the way to Skull Man were posted on the official Super Smash Bros. Ultimate website, and there are also many sections that were never released in the games, which I am personally really happy to see in there. Please check them out! Even though Ultimate is a game that stands out with its unbelievable amount of included music – many of these also being new compositions – I really hope that everyone will enjoy my own offering! And on that note, I’m going back to playing the game!